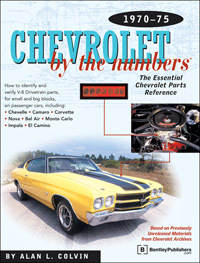 Chevrolet by the Numbers is the only authoritative reference for identifying and verifying the correct Chevrolet parts, by casting number, for your exact model. Searching for factory high-performance parts at swap meets? Chevrolet by the Numbers tells you which parts to look for, why they are special, and which engines those parts came with. Other books rely on secondhand information or out-of-date part numbers. Author Alan Colvin documented every casting number for every Chevrolet V-8 engine and drivetrain part from 1955 through 1975, using original source material in Chevrolet's archives, including engineering blueprints, technical service bulletins, and build sheets. He interviewed the original manufacturers and engineers and brings you fascinating stories of parts development from behind the factory gates. Most of this information has never before been seen in public. Two-bolt big block, showing rear oil filter area and 3 holes to be checked to determine crankshaft bolt pattern. (Pointer indicates location where portion of Vehicle Identification Number (VIN) is stamped on some engines. Brand new for the 1970 model year was the 400 engine block. It was similar to the 350, but with a different bore and stroke. 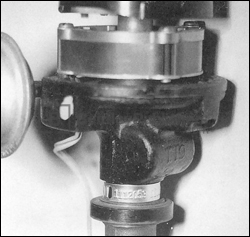 As a result, most of the internal parts were new, including crankshaft, pistons, rings, and rods. 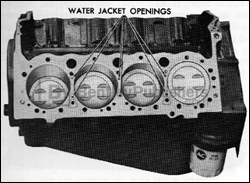 Head gaskets were not interchangeable, due to the water jacket holes shown above on the 400. 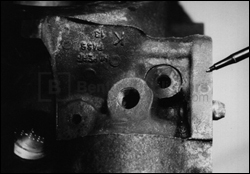 Cast iron distributor model number (in this case 1112053 for a 1971 Corvette) is stamped on metal band on distributor shaft.